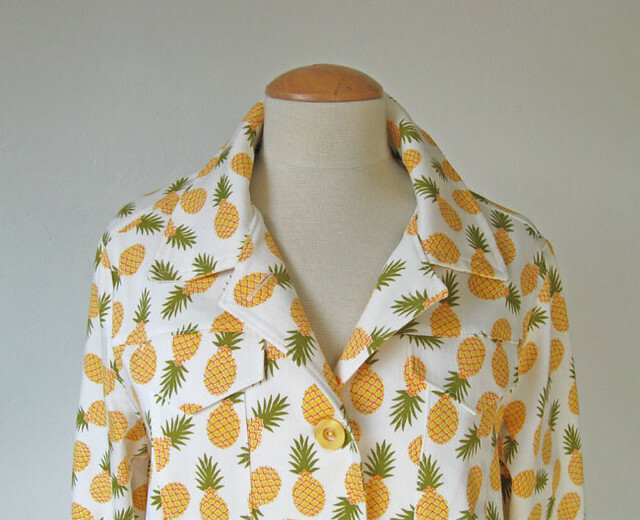 This blog post title is not referring to the movie Pineapple Express - a movie comedy with Seth Rogan from a few years ago - but I could not resist calling it that. 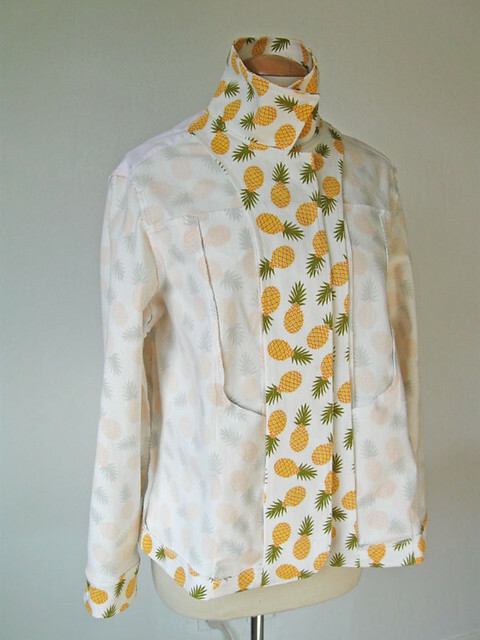 As it turns out, my latest project is based on what I learned by sewing the Jacket Express, and uses this pineapple print white denim. So in my mind - Pineapple Express. Earlier this spring I saw the fabric on the Girl Charlee website and showed it to my mom because like me, she has a hard time resisting a tropical print. And I had always wanted to make the Jacket Express pattern for her. In fact I bought the Craftsy class to get the pattern, and figured I would make one for myself to try it. As it turned out that faded red denim jacket is something wear all the time. For this version I made a muslin in her size and when she tried it on she hated it. I was annoyed but now I can admit that the fit and shape were just not right. So I played around with it, adjusted some of the pieces and tried again. No luck. At that point she said "I like the denim jacket I have, can't you just make one like that?" um, yeah...but I was trying to avoid doing that. However in the end it was the better way to go. OK, prepare your eyeballs but this one is a bit crazy. But kind of cute in a novelty way. And it came out so well! Now I want to remake next year in a different denim. Here is the original jacket which I copied. If you would like to see how I copy the garment here is a post where I copied my own denim jacket, and here is a post showing how I copied a shirt. That second post has more of the details on how to do it. I use a mixture of methods and I do recommend the Craftsy class on how to copy garments, it is quite good. Also the instructor (Steffani Lincecum) has a book on the topic which I got once at my local library so that is an option as well. So my copy looks darn close to the original. I lightened up this dark denim one so you can see the seam lines. I think that jackets are actually the easiest thing to copy, as the pieces on a jacket are mostly small so while it may seem daunting, I just go step by step with all the components, then test the pattern. 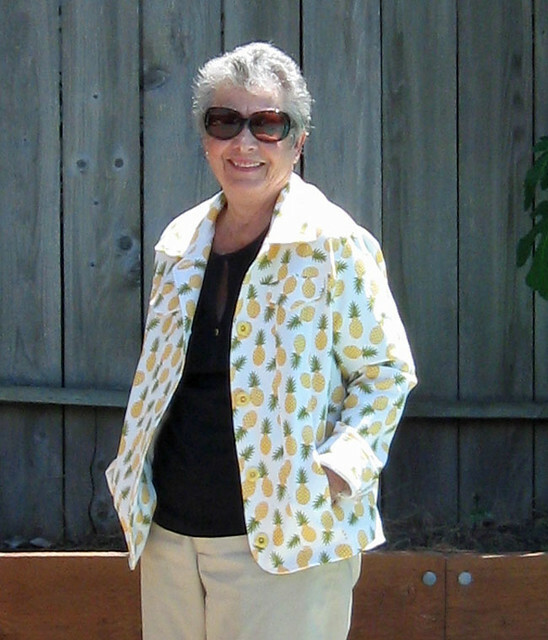 And here is my mom modeling her pineapple jacket. The sleeves are long but she likes to flip up the cuffs so I just copied as is. The only change I made from the original was to add a bit in the upper yoke to account for slight curvature at the upper back - which we will all have after years and years of hunching over computers etc. To accommodate that I added two darts which you can't even see on the outside but are more visible on the inside. 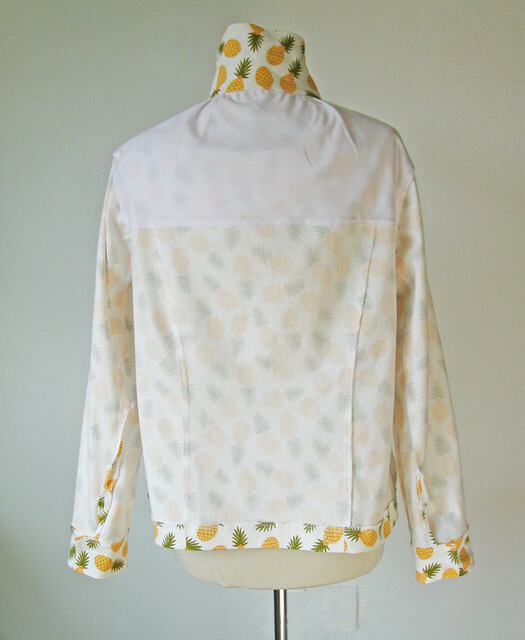 I used plain white cotton for the back yoke to make it lighter and also so the pattern would not show through. The jacket front is kind of interesting as it appeared to have very little shaping but as I copied the pieces I noticed that the center front panel is curved and makes a slight princess seam shape. Also that tricky center front panel is what creates the pocket bag, and while it was a bit of a pain to replicate it does work nicely. You can see the front shaping better when the jacket is flat on my worktable. At the upper yoke is just a flap, no pocket as I drew the line on unusable pockets! But I thought it needed the flap. Although then I skipped the button there. Oh well. I really learned a lot from that Craftsy Jacket Express class and used that order of construction here. Also the when, where and how to topstitch as she explains it is very good. That class is called "Sew Better Sew Faster" and it is apt. I think I made that first red denim jacket in about 9 hours and this one was even quicker. One of the most important things in making your own pattern is to put lots of markings. Reference dots to mark where the collar ends, or were the yoke meets the sleeve. They really help when you go to sew it up. Another look at mom, and about 10 minutes after I took this we jumped in the pool as it was over 100˚F that day. My folks put the pool in when my sister and I were about 2 and 4, we learned to swim that year and my dad always said that was one of the best "investments" he ever made :) Back in my pre-air-conditioned childhood, we were out there from morning to late at night. And my mom would say "sure, it's fine for you kids but I can't cook our dinner in the pool". Mothers always have the last word! No more jackets for a while, I just sewed up some of my other Girl Charlee knits and also completed a dress for Heather using one of her fabrics from Mood in NY. So that will be on the blog soon. I do have enough fabric left from this project - do you think a denim pineapple skirt for me would look goofy or fun? You know I am going to sew it up and see. 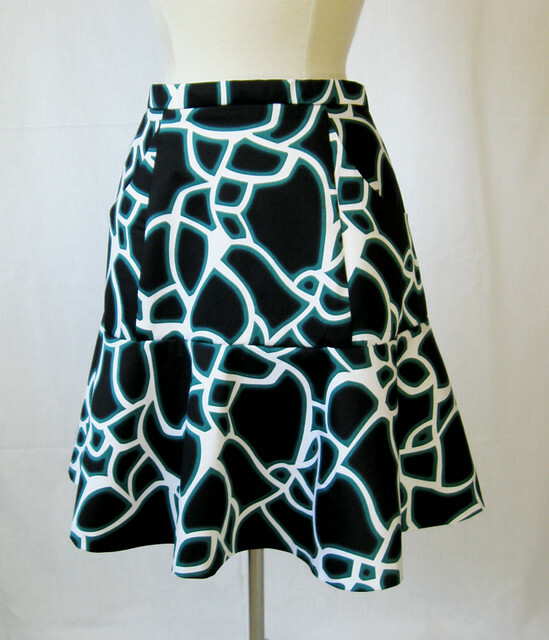 Stay cool and enjoy your summer sewing. Or step away from the machine and go outside! I think that's what I will do. 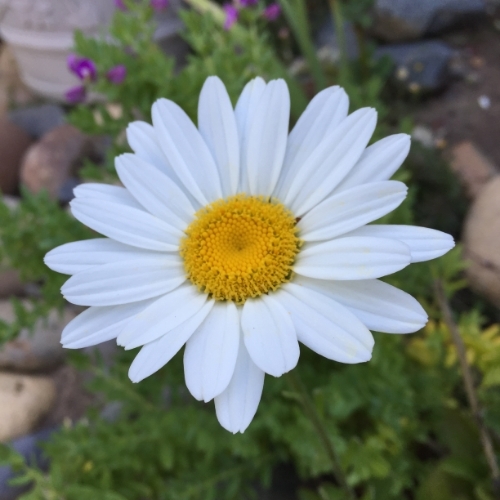 Today's SunnyGal garden photo is a Shasta daisy (I think that is what it is) that I got at a local plant sale. And it is finally spreading out a bit - I want that carpet of daisies to happen. A t-shirt perfected. Maybe not perfect - although it did come out nicely. I guess I am thinking that in terms of fit and shape, I have perfected this type of t-shirt for me. Mostly due to a bit of redesign on the neckline. and a small delight in the results of the binding on that v-neckline. Which I played around with a lot as I was cutting the pieces. To get that satisfying juxtaposition of stripe and color. This is perhaps the embodiment of a perfect fabric to me. 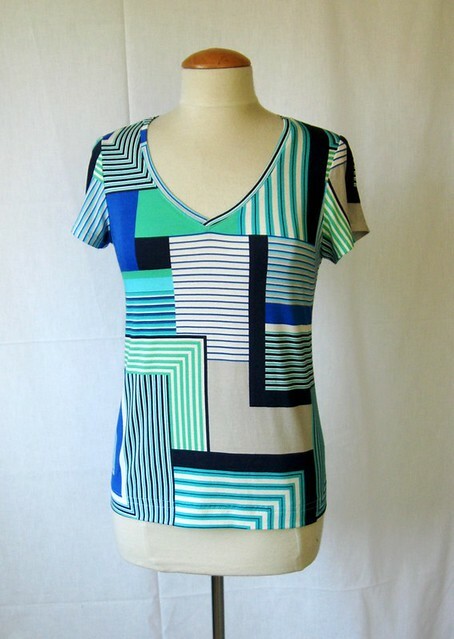 Graphic, angular, predominantly blue, aqua, white. with a touch of black to make it wearable with a lot of other separates. It might seem to bright for many but you know my love for vivid prints. PLUS it was on the half-off shelf at Stone Mountain recently so a nice quality rayon jersey knit top for about $ 10. Score! Also satisfying, the way the print layout is kinda sorta centered and yet not. Perhaps balanced is the right word? Or maybe I am reading too much into it. But really - I think that often the success of a final garment is due entirely to some serious thought, concentration and planning when cutting out. There are many times when it actually takes me longer to cut out than sew an item. And cutting out is my least favorite part of sewing (probably also for most people). Grain - I am a bit of a fanatic. Completely flat - no wrinkles. Pattern placement if a print. For stripes and plaids, checking and double checking. Yeah, all this can be super tedious but pays off in the end. Getting back to t-shirt perfected. I highly recommend this pattern which is Jalie 2805. If you sew for yourself and other people - such as small people:) then the value in these Jalie patterns is incomparable. All sizes from small kids through women's size. 4 different necklines, including a turtleneck and the instructions for the V-neckline are so simple and yet result in a perfect binding. Also once you get the fit down you can riff on the pattern by changing all kinds of things, neckline width, color blocking, etc. Which brings me to the changes made. I originally made this pattern back in 2012 (here is a link to that post). 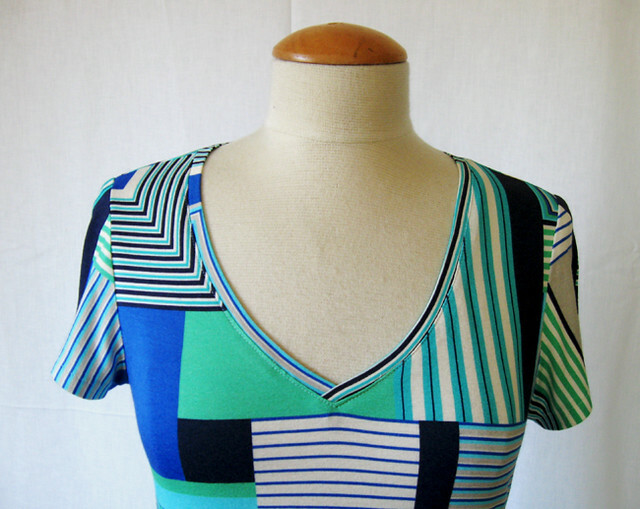 And while I really like the original version I wanted the neckline to be a bit more open. 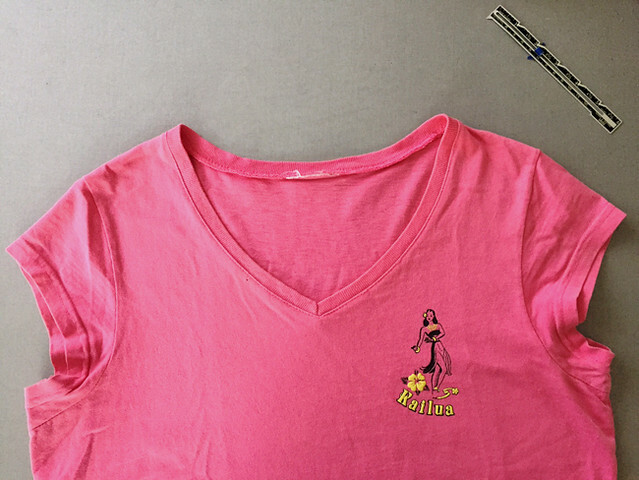 I have this t-shirt which my sis gave me ages ago, from a little boutique in Kailua (Oahu) this is no longer there (sad tears, I bought so many cool things there, t-shirts, swimsuits, sandals and when it closed I was so bummed). Anyway...the neckline on this v-neck t-shirt is just right for me, not too low but a little lower than the Jalie, a bit wider and slightly rounded. (note I am not super crazy about the strangely abbreviated sleeves on this t-shirt - and I have another copy in turquoise where the sleeves are a bit more normal shaped). So I decided to copy the neckline of this shirt and apply it to the body of the Jalie top. Because why not? And the Jalie pattern actually facilitates this because the way they fit all the versions on their pattern pages is to separate the tops from the bottoms rather cleverly, so the top portions are interchangeable with the bottom pieces. If you have made a Jalie than you know what I am talking about. One tiny note about fit: I found the sleeves on the Jalie pattern to be a bit skimpy and I am not particularly broad in the back or arms so to counter that on my chosen Jalie size which I think was U, I added 1/2" width on the back pattern piece at the underarm tapering that away by about 4 inches down. and then added 1/2" extra on the sleeve back to match which alleviated that tightness at the back/underarm area. Like any pattern it needs fitting but once you get it squared away it is a workhorse. How to copy the neckline? Here is a picture I have that shows a quick and easy method. I think I used this photo on a Craftsy blog post. Wax paper is such a great tracing medium for things that are flat like a t-shirt and you cannot beat the see-through-ability of it. 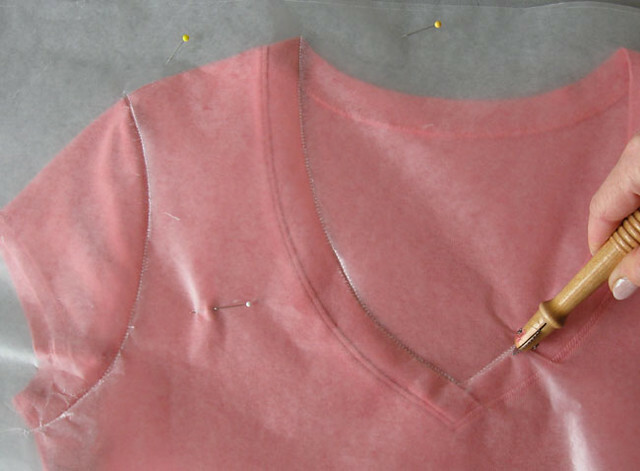 Back to the t-shirt neckline, I use the Threads Magazine video method. I have linked to this before and if they ever take down this video I will be bummed as it is the best explanation I have seen for this technique. Plus no pattern piece required! 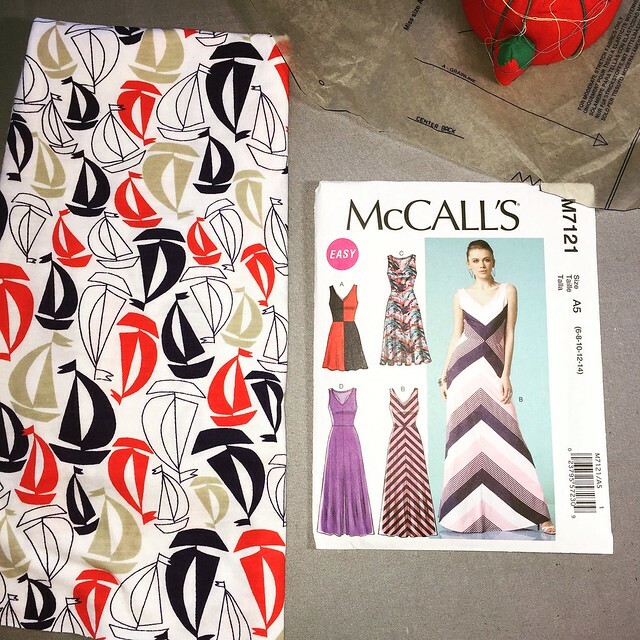 Summer sewing in full swing, I am just finishing a dress for Heather using her first Mood fabric (pattern is Vogue 8787, a really nice pattern that is for wovens but I have made the cowl version in knit twice and it is great, blog post and pics to come with some fitting info). And some summer and pre-vacation sewing for me. 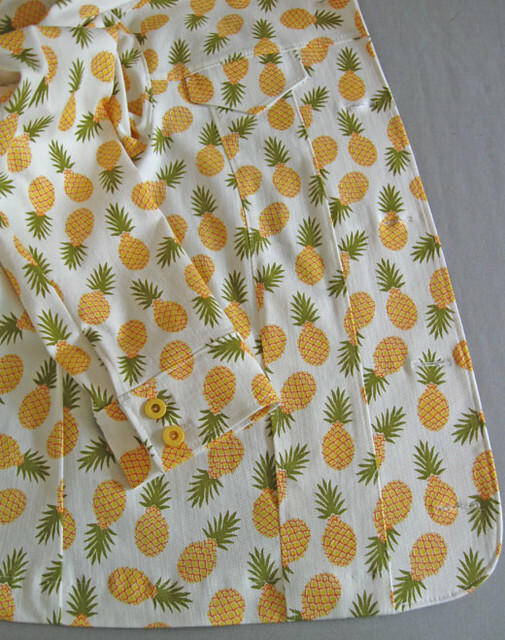 The usual collection of slightly ridiculous tropical prints...hey whatever makes you happy, sewing-wise, right? 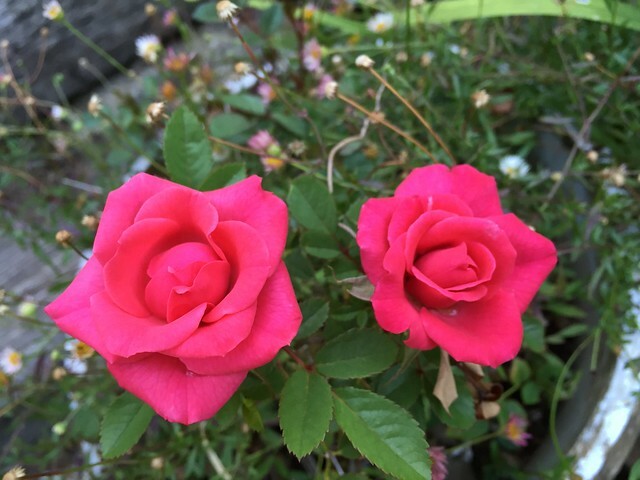 Today's SunnyGal garden photo, these are miniature roses and this plant receives no attention but like most of my roses keeps on blooming. Enough with the sneak peeks on this outfit, right? I put the last stitch on the hem about 2 weeks ago but it took a while to get some photos organized, and I thought this deserved something better than my usual photos. My pal Alice can be counted on to take my best blog photos and she is always on the lookout for a stray thread or the odd wrinkle. Now that is a good friend, right? 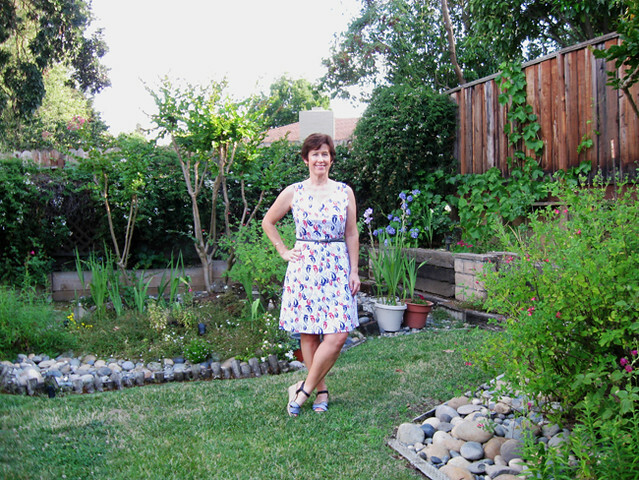 This is the Alameda dress from Pauline Alice patterns. I actually didn't take any photos of this while sewing, it is fairly straightforward in construction. Most all of the fitting was done as I sewed it up. I chose a skirt size based on my hip measurement and it was a bit on the big size, both all over and especially the waist - however all those princess seams in the skirt allow you to shape the waist/hips to get a great fit. After doing that it was a smudge big around the hips also, but since the zipper goes in last its an opportunity to take a larger center back seam. If you have read my blog for a while then you know I don't sew very many indie patterns, I don't see many that are interesting or different from patterns I have. 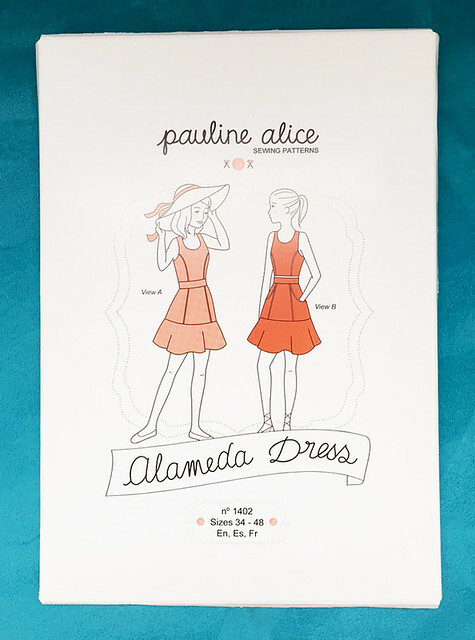 But I always noticed the Pauline Alice patterns and thought they had some interesting details, a little more complexity than is often seen. By the way, her patterns are very high quality, the paper is bright white and a good thickness which makes it easy to trace onto tissue (which I always do when using this type of pattern). The instructions seem thorough as well, and in 3 languages. 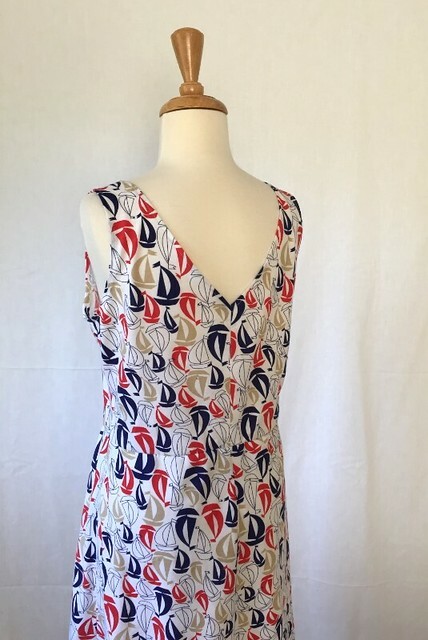 When she came out with this Alameda dress/2-piece pattern I thought it was very pretty but noticed that on her website there was no line drawing. So I just figured I would email her and tell her that as a long time pattern buyer I would not buy a pattern where I couldn't first look at the technical drawing and she should consider putting those on her site. Maybe that sounded a bit, I dunno, pushy? or helpful? Anyway - she wrote back immediately and uploaded the technical drawings. And then we became acquainted via email. Long story short she asked me to be a tester for a new coat pattern and I usually tell people no, but she enticed me by sending a photo of her own test version of the Quart coat pattern. So I replied Yes! as that coat is so fantastic. I did test it and gave her some info on the pattern, particularly in the sleeves which she appreciated. And then I did make a real version of the Quart coat for a friend of mine. I have had this pattern for a while and decided that as soon as the weather warmed up I would make it. Which sent me searching through my fabrics to see if I had anything suitable, and this cotton sateen I bought at Stone Mountain last summer seemed like a good choice. The colors are more visible here and you can hopefully see the seaming and pockets. The fabric is actually navy blue, green and white. I think it is one of those "you either love it or hate it" fabrics but now that it is finished I love it. 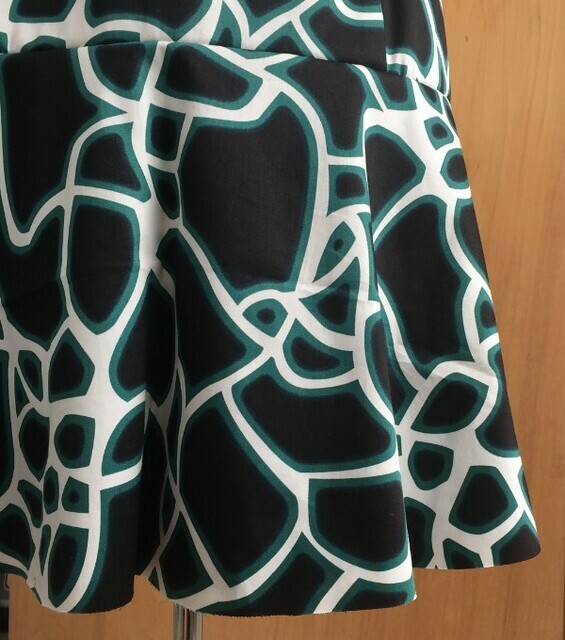 I chose to make the two piece version of this pattern as I figured I could wear the skirt on its own with a solid top. Yes, it is the two piece version of the pattern though it might not appear so in that first photo. See, I'm showing you here. The things I do for you! The only major modification on this outfit sticks with the idea on the pattern, but in practice I didn't use all the pattern. Because I had the pattern pieces out which I used for this dress - which you should go look at as it is one of my favorites and has a lot of fitting info. Anyway...I thought hmmm, that top part fits so well, the shape is similar, and I figured out the shoulders/armhole etc. so oh heck, why not use that for the crop top portion. So I did. Any I bet you would not have noticed had I not told you. 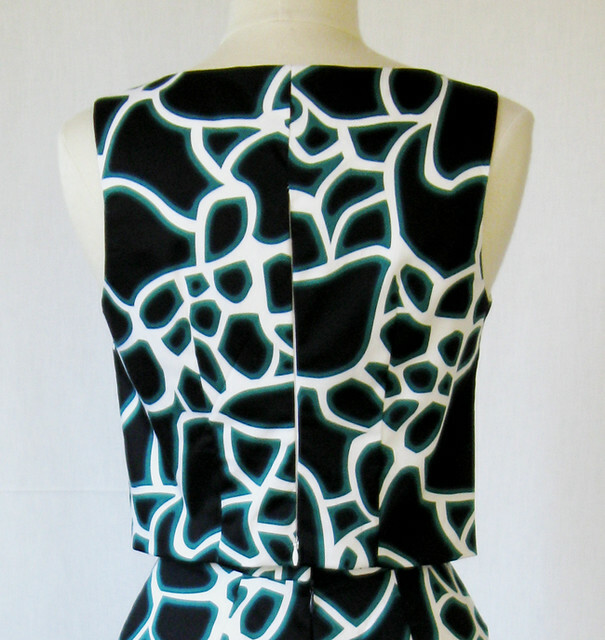 Although I did modify those pattern shapes to match this pattern more, by deepening the front neckline, and then making it a pull over the head top with the zipper opening at the waist. You can just see the zipper tab at the bottom there. Which gives a super clean finish on the neckline and armholes of the top. So another clever idea. And apologies to Pauline Alice for not using all her pattern pieces but close enough. I should have taken some without my hands in the pockets. But you know that pockets like these are irresistible. And if you like skirts with a flounce then I highly recommend. I know the flounce is not for everyone but I have always liked it and this has a great amount of flounce. Is that a thing you can measure? maybe not, but sewing satisfaction, this one is a winner. 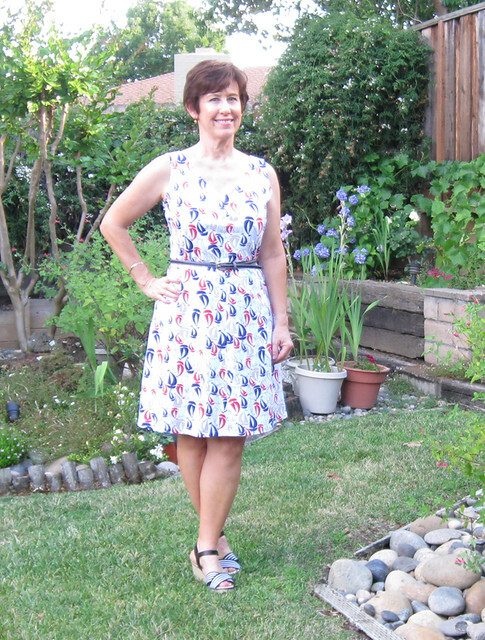 Happy weekend sewing, I am off to our Bay area Sewing meet up group on Sat. where myself and 3 other local seamsters will be talking about blogging (how we got started, surprises, challenges, changes over time, advice and then some show and tell of things we have sewn). Always fun to talk sewing with like minded obsessives! 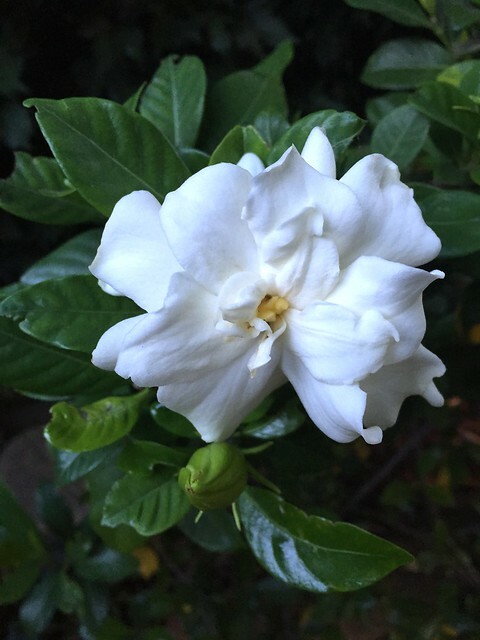 Today's SunnyGal garden photo, one perfect gardenia. The fragrance by the front door is intoxicating when the bushes are in full bloom. They only last a day or so, which maybe makes them all the more beautiful. Random Threads is a good title today because I have been totally random in my sewing, flitting from one project to another, with a bit of sewing instruction thrown in for good measure. 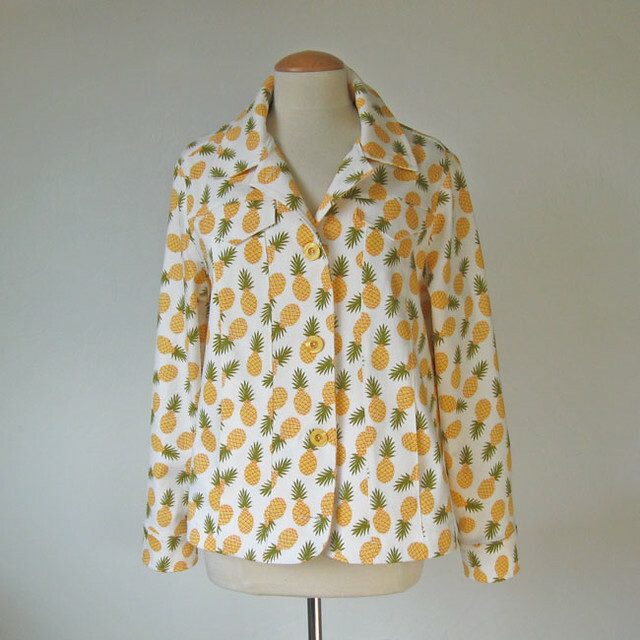 As a follow up to something mentioned previously, here is a link to the final jacket post of Meg who came over for an intensive jacket sewing lesson. Her blog is Meg Made This, and if you want to see her completed jacket check out this post: Meg Makes a Jacket, the Finale. Look at that nice crisp lapel. You will to click over to her post to see the rest of the jacket, and then look at her next post to see the cute dress she wore with it. What a great jacket. 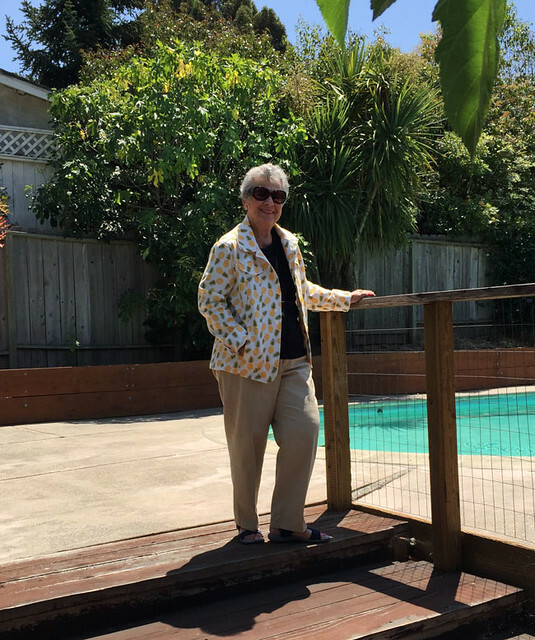 I am so happy she came for a lesson and now has a great jacket pattern that she can make in a different fabric. Is anyone else looking forward to the new season of Project Runway? Starts August 6 on Lifetime. Yes, that show has totally fallen apart and yet - I will still watch it. So glad I have Tivo - can zip through the commercials and the repeated scenes. Mostly I'm interested in seeing the final garments and then the judges critiques. Since they used to show a lot more construction in the early years of the show but now seem to cram more nonsense into each episode. But like I said, a TV show with sewing machines and trips to the fabric store, I am in. Plus I see there are a couple of contestants from the bay area so that is always interesting. Also they do show the episodes on line I think a day after they air so if you don't do TV you can probably see the show. I wonder if you are overseas if you can view on the website? New Vogues.........Mostly blah to me, with a few very kooky or art-teacher looks thrown in for good measure. I never get too excited about fall season sewing - just not my interest. And now I will reveal - please don't throw any tomatoes (or tomato pincushions) at me - but I really like this, Vogue 1461. Also it is by my favorite Vogue pattern designer Donna Karan (or whoever is working in her design studio these days). Plaid yes - and then the release pleats in the skirt. I think it is cute! However I will not be making this up now or ever. But I just like it. I did have a very similar skirt years ago with that tight seaming over the hip releasing into just that shaping, and my dress was rose red silk duppioni. Very holiday outfit and I loved it. Wonder what I ever did with that? OK, onward to more practical items. Kind of, sort of. I think I have a medical condition called Stripe-itis. 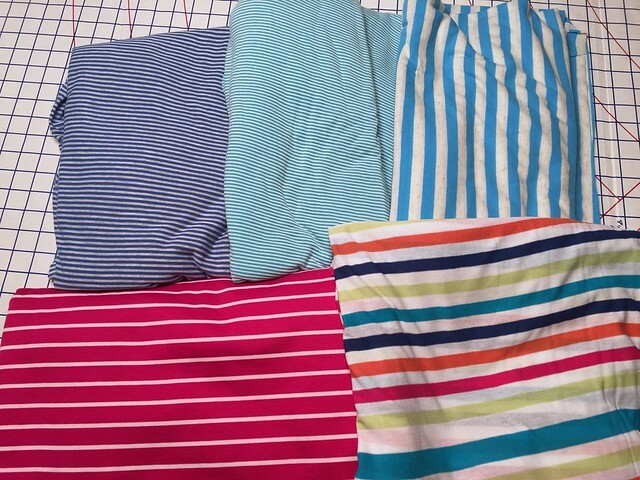 Which I just made up and is characterized by excessive purchasing of unnecessary striped fabric. All jersey knits except the fuchsia and white on the bottom left which is more like a ponte weight. What am I going to do with all these stripes? Top left, got that at a rummage sale for a few bucks, middle top bought at Joanns with a super coupon, the remaining three ordered from Girl Charlee. (see marketers those "hey it's a sale" emails work on me). I like them all but summer is flying by so who knows what I will get sewn up. As for my next project, I am going to start on some of the fantastic fabrics that my friend Heather bought at Mood and Elliot Berman in NY. 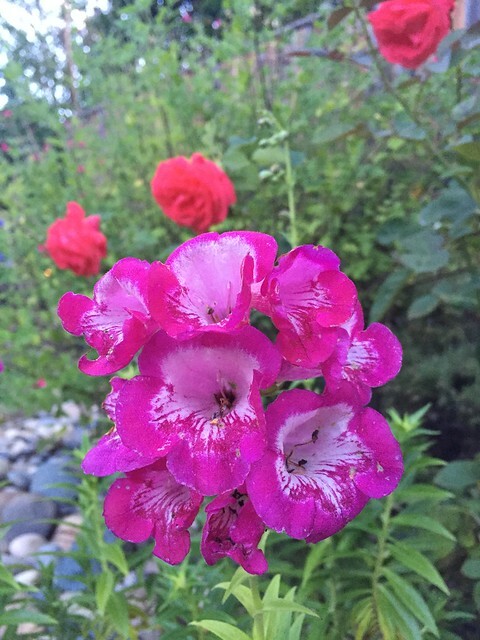 Today's garden photo, these penstemon are definitely in my top 10 of garden plants, they are so hardy and the flower colors are fantastic. The idea for this post has been floating around in my head for weeks now and I realized that is has an expiration date. Time to get it going as sewing for summer probably comes to a close in parts of the globe sooner than it does here in sunny California. 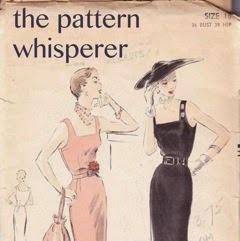 A Pattern Whisperer post - the topic is summer sundresses. The category of summer sundress has some very specific elements to me, and granted these are just my opinion on features that make this type of dress different from your other wardrobe selections, such as dresses for work, formal events or even a casual everyday dress. So what makes a sundress special? I love the category of resort wear - which sound a bit what? Elitist? Too specific? Brings to mind women of a certain age swanning around in caftans. That is not what I am talking about. I think of a sundress as that item you might wear when the temps are high, but you want to look pretty and be cool. To wear instead of shorts and a tee. A sundress needs to be sleeveless, and definitely show some skin, so no high necklines or collars. 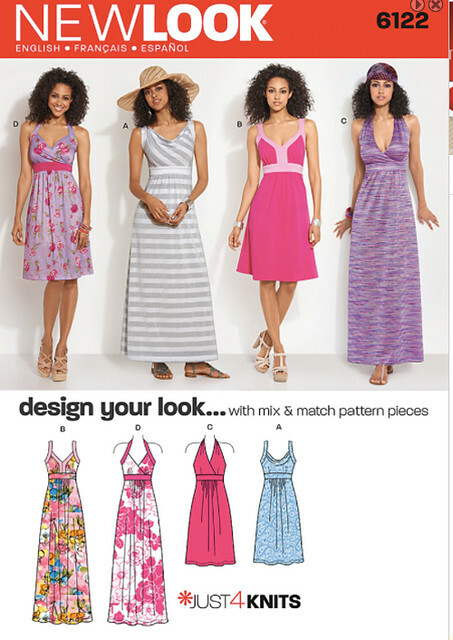 Thin straps, halter necklines or cutouts make it a sundress in my book. Of course fabric choice is everything. Mostly cotton or linen, maybe a cotton or rayon jersey. Depends on the style but nothing that needs a lot of lining or even pressing. Something to wear to a backyard barbecue or a casual outdoor wedding. 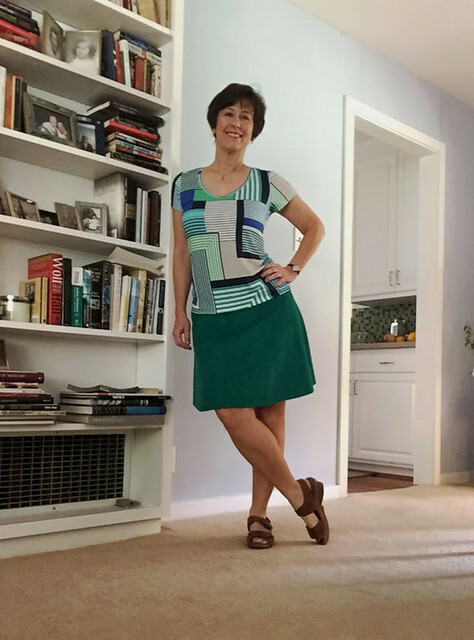 As in my previous Pattern Whisperer posts, I mostly suggest patterns from the major pattern companies, Vogue/McCalls/Butterick, Simplicity/New Look with a few ideas from Burda. 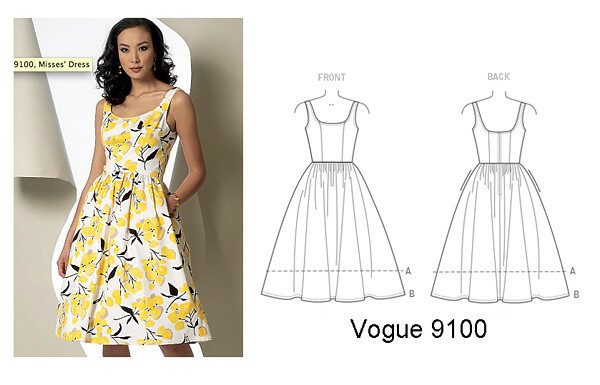 First up is one that I consider the quintessential summer sundress, Vogue 9100. Having shown it in that fabric seals the deal - so cute. It has an interesting bodice which I actually think might be quite easy for fitting. The princess seams are moved to the center and finish in the center neckline. If you have trouble with gaping necklines this is a sneaky way to be able to adjust the dress on the fly, instead of on the pattern. If I were making it for myself I would add an inch in length to the bodice, plan on shaping it over the bust for a close fit, and presume to shorten it at the shoulder seam, and center back. In fact I would shift that side zipper - which bug me - to the center back just for ease of fitting. And note that if you don't want such a full skirt you could reduce the circumference or even use a different skirt pattern. Cutouts - when else can you wear them? Well I don't know your life but probably not too often in winter :) I like this Simplicity Amazing fit pattern because: Amazing Fit. They do have a bit too much ease but if you can figure out the starting size and put in a bit of fitting work they are really nice. Plus offer more than one pattern view and I always like things that have more than one look for my pattern dollars. Cut in shoulders, my Fave! cute cut-out but looks bra-friendly. Comes in the full range of sizes. Pockets! Nice princess seaming over the bust. Cup sizes. 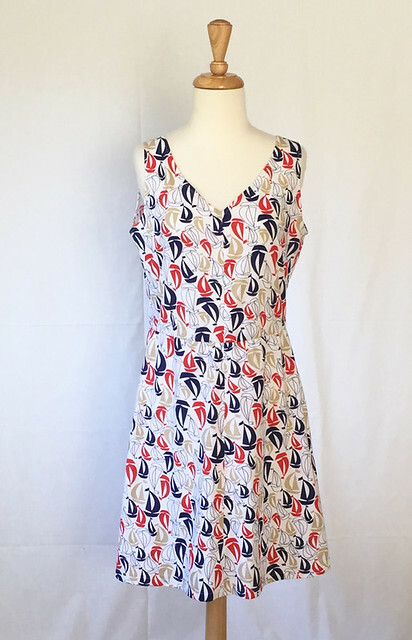 I just might have sold myself on this one - like I need any more summer dresses and/or new patterns. 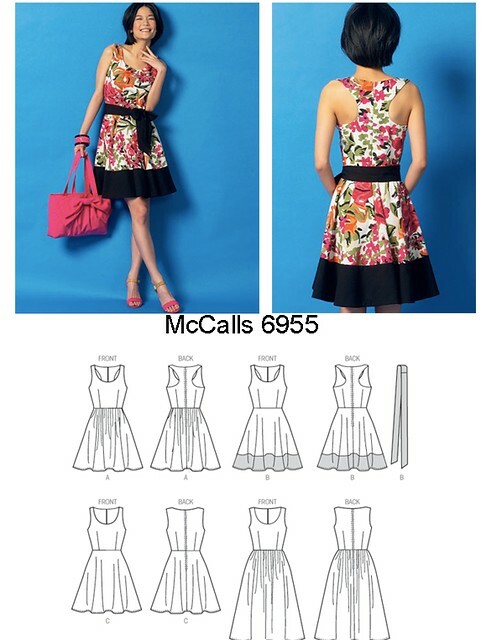 For something a bit more sporty, McCalls 6955. I like that it has both a non-gathered skirt and a gathered option. The shaped back gives it a lot of interest but I think you could easily wear an adjustable X-back bra which is nice. I really like the contrast hem look, I could see making this in two complementary fabrics instead of the solid contrast. This New Look pattern must be a really good seller because it has not been discontinued and I first bought it at least 4 years ago. I have used this bodice for a lot of different things and my pattern pieces for the gathered skirt are my TNT for that look, they have so many pin holes and fold marks but it is full but not too full so doesn't actually take up all that much fabric. It also has the 2 halter views so a lot of choices. 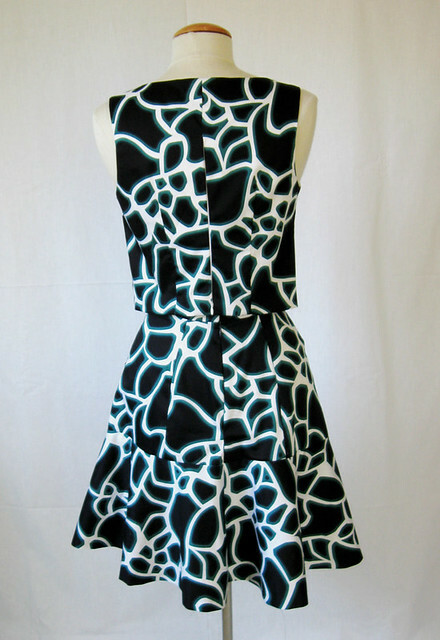 This was the pattern for this dress and I first used it for a dress that I gave to my hairdresser. Works really well with cotton sateen and see this post for a clever trick that I copied from a J. Crew bridesmaid's dress. This Simplicity dress is probably a tricky fit, as the bodice has to fit just so for the contrast to look right but I like the sharp white contrasted with black. 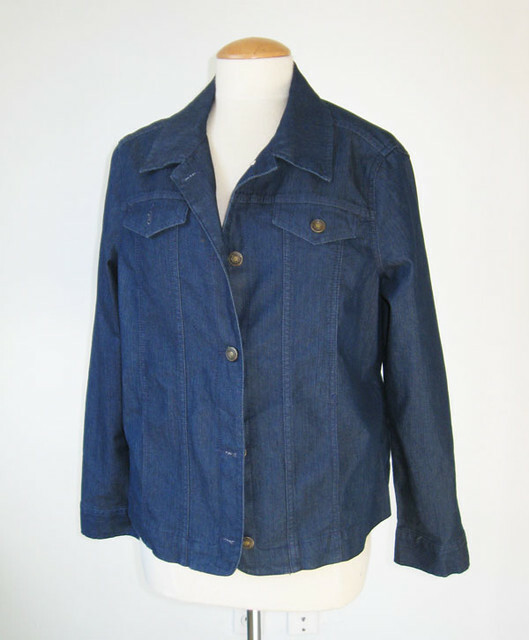 Or in chambray denim with a dark denim accent. 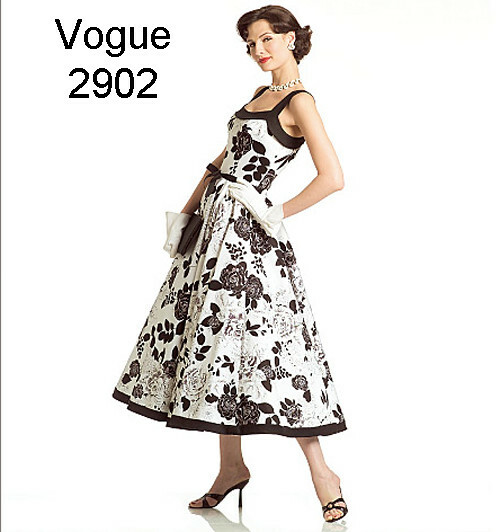 It is a similar idea to the Vogue 2902, which is also very pretty and probably a big fabric hog. Somehow I think the Vogue pattern might be both easier to sew and fit, and also must be another one that sells well as it has been around a while. Both versions on the envelope of this Burda pattern sold me. 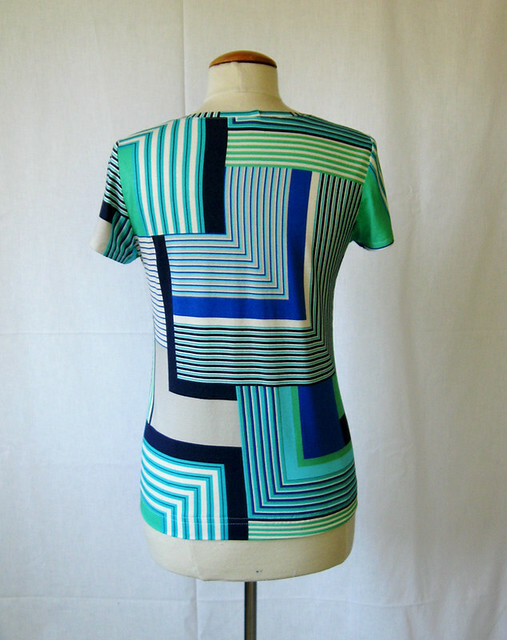 For a similar shape and easy wear, this Burda downloadable could be sewn in any fabric and be perfect for summer. You could change the straps to anything you want, even halter tie. The smocked back could make fitting very simple. The pleated front is also easy to wear without being too much fabric. Kind of the easy version of a corset style dress. As for knits, there are plenty of summer styles to choose from. One that caught my eye is this New Look pattern. I have had good success with these New Look patterns that offer a multitude of looks in one pattern envelope. There are a lot of small pattern pieces to rummage through to find what you need to make up the selected style, but this one doesn't look too bad at all. A lot of New Look patterns have this same skirt, kind of straight, gathered at the center of the empire bodice. Super easy to wear (read: hides the big barbecue meal) but not full looking since the sides are tapered. I like that grey example - the cowl neckline - not the fabric choice. But a easy pattern for knits with some cute options. 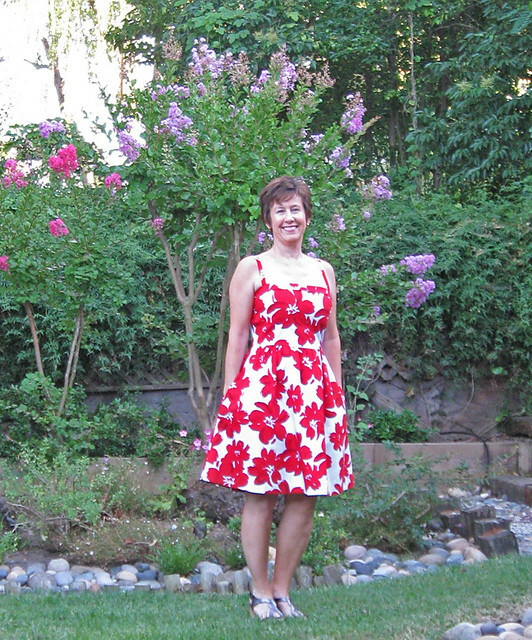 I know there are zillion choices out there for summer sundresses - and I have sewn many of them. My appetite for this type of pattern always exceeds any need for something new. If you read back through this blog you know I have more than enough in this category. And just today I saw this Decades of Style pattern which is so pretty. And I love the Lonsdale dress from Sewaholic. Why have I not made that? Too many patterns, not enough time. Are you with me on that one? 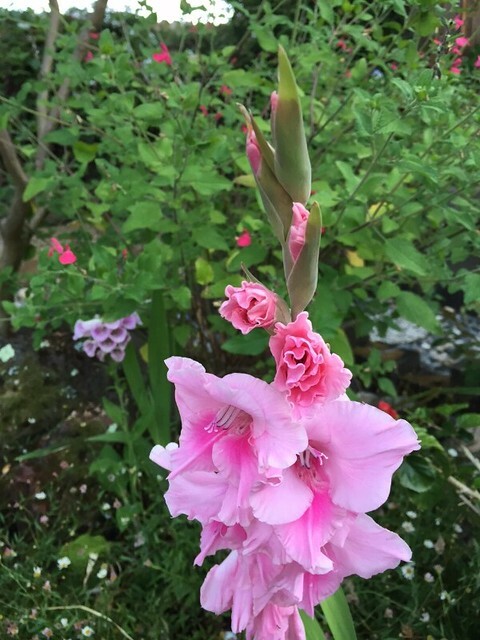 Today's SunnyGal garden photo: I planted so many gladioli bulbs and they are randomly popping up all over the yard. The colors are great but they don't last very long. A one hour dress. Doesn't that sound great? So I was thinking when I saw this pattern, McCalls 7121. It is actually one of the simple styles that they didn't mess up with a hideous fabric choice in the example photos. Very cute with the diagonal stripes and includes a maxi version. (well that black and red example is a bit weird). So I figured I would sew it up with something from the stash - a novelty knit from Girl Charlee. I am a sucker for certain novelty knits - I just ordered another one from them, a very eye-popping palm tree and stripe combo. Which has arrived and caused me to question my selections. But by the next morning I was working out the perfect pattern for it. However we will set that aside to reconsider this. A rather distant shot - look at the pretty grapevine trailing up the fence and not at my dress. I somehow feel I have achieved geriatric housedress with this combo of fabric and pattern. Or maybe 1970's Sears catalog? Although I was able to pair a belt with it that I bought ages ago in Italy on a "last day of in the country buy all the leather items spree" and which I have never worn. How is that? Who knows. I don't make many navy blue or navy blue adjacent items so that might be why. Also my cute navy and white espadrille sandals. Perhaps this dress is growing on me. Actually I can say that it is because 1) super easy to sew and 2) quite comfy to wear. Or possibly because it was 102˚ F at 6:15pm when these pictures were taken. Yes, after 6:00 and still over 100. Illustrating that adage, be careful what you wish for - I long for summer the rest of the year and don't think at all about the scorching days that will arrive. So a cotton jersey dress is super easy breezy to wear. Pattern envelope and a better look at the fabric. I have to say that the fit on the pattern was quite good, and that includes the fact that this cotton knit is not very stretchy at all. But the width of the shoulders was nice and the armholes not too low. Two new McCalls patterns this year that fit reasonably well - I might have to look more closely at them in the future. I made this up with the idea of testing it out before I took the trouble to make a diagonal stripe version - but now I am over it. Just too simple for my taste, and too many other patterns I want to try out. On the dress form. I had to put it on my super tiny size 2-ish form because the other one that is more like my size has slightly larger shoulders and I could not get the dress over it without breaking the stitches. The neckline and armholes are just turn and stitch, which normally I don't like in a jersey but this knit pressed so crisply that it worked really well. So it does look a bit goofy on the form. There is 1/4" elastic at the waist which is possibly not necessary but it did give it a bit of shaping. And one last shot of me "glowing" in the heat. The forecast is for lovely warm but not super hot over the upcoming 4th of July weekend which sounds good to me! 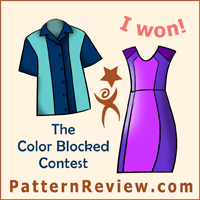 I am just about finished with my two-piece version of the Pauline Alice Alameda dress. What a fantastic skirt silhouette - I can't wait to wear it. My friend Heather bought lots (I mean lots) of fabrics in NY so you will see quite a few designer fabrics sewn up here in the coming months. 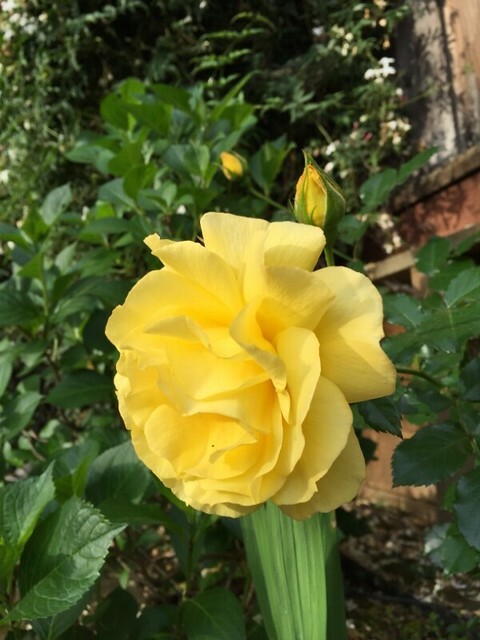 And today's garden photo, the very hardy yellow rose that doesn't get quite enough sun but reliably blooms anyway. Love that saturated color.